If you are interested in purchasing for retail, please contact us for pricing and requirements. Engaging children in a church worship service can often be difficult. How can a parent, grandparent, or church leader help a child enjoy listening to and learning from the sermon? 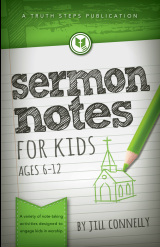 Sermon Notes for Kids provides the much needed direction that many have been looking for. It contains 7 various note-taking activities designed for kids ages 6-12. There are 4 bonus sections included: Missionary Moments, Prayer Meeting, Communion, and a Guest Speaker Log. Each note-taking activity section contains instructions as well as additional tips and extra challenges. Sermon Notes for Kids was born as a result of creator Jill Connelly's years of sitting alongside her 4 children during Sunday worship services. All the activities in this book have been kid tested and approved! Parents, grandparents, and church leaders will all find this book to be a valuable tool. But be warned! This note-taking journal has the potential to quickly become a keepsake you will treasure for years to come as you look back at the child's notes and see how much he has grown in his ability to listen and comprehend even seemingly difficult sermons. For convenience, this spiral-bound book is sized to fit in most standard Bible cases and is easily managed on the lap of a child as he sits in the pew. Similar in format to Sermon Notes for Kids, the Teens edition offers more challenging note taking options for ages 13 and up. Sermon Notes for Teens is a note taking journal designed to help teens remain engaged in the church worship service. It contains a variety of note taking methods that balance challenge with enjoyment, while at the same time promoting active listening. Sermon Notes for Teens provides the much needed direction that many desire. It is sized to fit in most standard size Bible cases: its spiral binding makes it easy to manage. The journal style makes it easy to go back and reference past notes. For those adults who enjoy taking sermon notes, this book is for you! But it's not your ordinary note-taking journal! 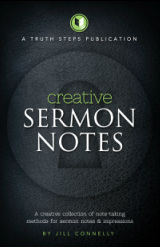 Creative Sermon Notes contains 6 different methods for taking notes. The methods are simple enough to not detract from hearing the message the Holy Spirit has to impress on your heart. You will really enjoy the creativity this book has to offer.